Summer is upon us. More people are hitting the road for road trips or traveling to their vacation destination. Perfect timing to attract road trippers with the Tourism Department’s launch of the “Summer of the Mother Road” promotion. History and culture abound on and off Route 66 in New Mexico. From Glen Rio to Manuelito, the Land of Enchantment offers a travelers a unique stretch of the Mother Road full of stories from a bygone era kept alive. Also watch the “How to Captivate Road Trippers with the Summer of the Mother Road” webisode to learn all about the Tourism Department’s efforts to capitalize on this slice of Americana and how you can drive travel to your destination with Summer of the Mother Road Toolkit. 1. Look through the Summer of the Mother Road microsite here to determine if the historic route passes through or near your community or business. 2. Know how to use this toolkit! In case you missed it, watch the "How To Captivate Road Trippers With The Summer Of The Mother Road" webisode and others by visiting our Education page. 3. Follow #NewMexicoTRUE social handles on Twitter | Facebook | Instagram so that you know when we’re talking about road trips in or near your community or business. Then, repost and share the content! 4. Get familiar with the Western Road Trips Research Summary. Click here for the research. 5. Invite the tourism department to visit your community and create Summer of the Mother Road content about your area by requesting a Site Tour. Email industry.relations@state.nm.us. 6. Is your business on the Mother Road? To be considered for a feature on New Mexico True social media platforms, send 50 words, an image, and a link to your website to digital.media@state.nm.us for consideration. 7. Catch the eye of road trippers planning their summer vacations by creating a free business/attraction listing through the Partner Portal. 8. Promote your special event that falls on the Mother Road, highlights Route 66 heritage or is themed around road trips (i.e. classic car show), on NewMexico.org through the Partner Portal. 9. 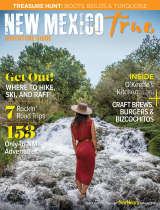 Share your event with New Mexico Magazine by sending an email to events@nmmagazine.com. See the most recent coverage on the Mother Road by New Mexico Magazine. 10. List your deal or discount for Mother Road road trippers on NewMexico.org by submitting it through our Partner Portal. Let us know you submitted a new Summer of the Mother Road business, event or discount listing by sending an email to industry.relations@state.nm.us. We want to share your listing as a best practice with the rest of the industry! 11. Have a unique character, place or thing that ties into the Mother Road? Send your story idea or media pitch to industry.relations@state.nm.us and queries@NMMagazine.com for a chance at earned media coverage. 12. For a chance to contribute to the New Mexico Tourism blog, write an article fewer than 750 words about something unique to your community or business related to road trips or the Mother Road. Submit your article with an attached photo to industry.relations@state.nm.us. 13. Send YouTube links to any videos you’ve produced incorporating road trip stops in New Mexico to be considered for inclusion on our playlists to industry.relations@state.nm.us. 14. Share your Route 66 graphic made by the Tourism Department on your social media platforms and website or request a customized graphic by sending a high resolution photo to industry.relations@state.nm.us. 15. Tell us what your business or community is doing to incorporate the Summer of the Mother Road by emailing industry.relations@state.nm.us. 16. Make sure your regional marketing board is aware of what you’re doing and helping you promote your Mother Road stop by attending a region board meeting or emailing the chair of your board. 17. Share this toolkit with businesses in your community and encourage them to participate. 18. Show your social media network what they can expect on their trip by sharing the Summer of the Mother Road video. 19. Use #NewMexicoTRUE on your social networks when posting and sharing about Summer of the Mother Road.